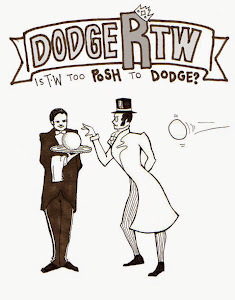 DodgeRTW - is Tunbridge Wells too Posh to Dodge? Be part of "The Stroke Association All Stars"
If we form them , you will join. A 'can do attitude' towards playing dodgeball in T.Wells. As if, organising and promoting a charity dodgeball tournament almost single handedly isn't enough, I've decided to form 'THE STROKE ASSOCIATION ALL STARS' to play in the tournament. We've got a few teams from London coming down, groups of friends and company teams already registered, but where is our team of underdogs who've never played before and met on the day? 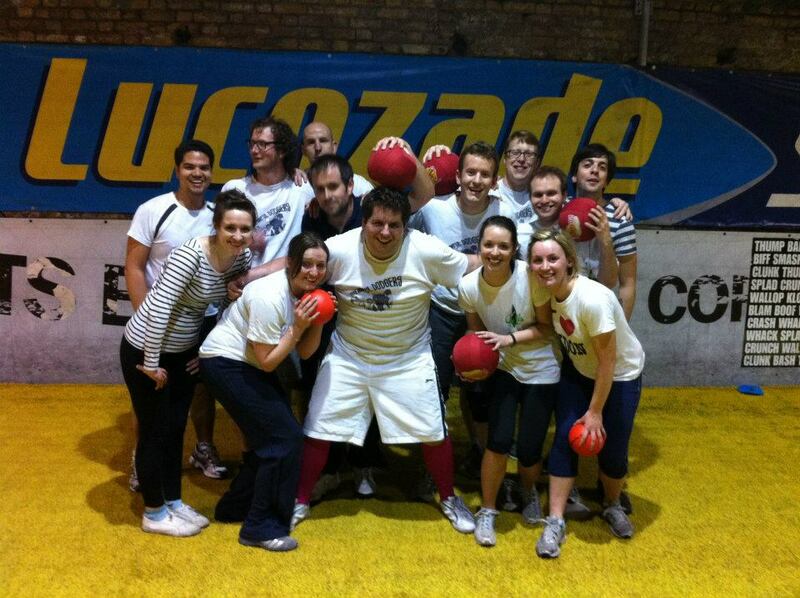 Dodgeball is a highly social sport and we actively encourage people to give it a go at least once. Once you've tried it you will be hooked. If you want to play but your friends are too busy/ lazy... never fear. Drop me a line and you can join my hopeless bunch of chancers. WHO ARE THE 'THE STROKE ASSOCIATION ALL STARS? DO I HAVE TO HAVE PLAYED BEFORE? No, only your captain would have played before (me) so you have someone already in place to blame for every defeat. Play for the enjoyment. Play fair and have fun. £10 donation to the Stroke Association. How many of the 5 D's of dodgeball do members of your club use everyday? Who has a laser throwing arm? Who has buckets for catching hands? Which club member is most likely to Duck out of a 50/50 challenge? Who always Dips their hands into their pocket in the bar? Who always Dodges their round? ....and who doesn't like to refuel after a sporting activity with a few Drinks? I'd love to invite your team to Enter a team into our Charity Dodgeball Tournament in aid of the Stoke Association. A great opportunity to try a new sport, have a fun day and raise money for a tremendous cause. The desire to be dodgeball legends. 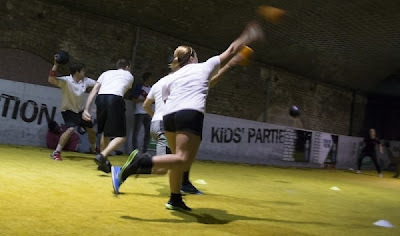 If you fancy some alternative pre-season training or simply an original idea for a club social, dodgeball is the perfect mix of semi-competitive fun and sporting underachievement. Feel free to invite, club member, friends and blatant ringers. Any questions: Please feel free to Contact me. We're legit!!! (in case you were wondering). 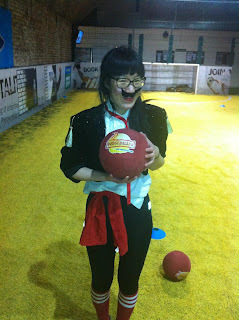 You don't have to work in an Eastern European Nuclear Power Plant to be good at dodgeball (although it probably helps). Instead, it turns out that all you have to do is fall in with the wrong crowd in hipster Angel and voila! You're a Dodgeball UK Legend. Christina Wong tells us about her experiences playing the game, gives some stick to the English for their attitudes towards social sport, but doesn't expain her questionabe dodgeball outfit. Hi Christina, in the London dodgeball circles, you are affectionately known as 'The Bullet'. What do you put your deadly skills down to? Well, I did play softball a lot. How did you find out about dodgeball and what has made you keep coming back? I hadn't played the game since primary school - I loved playing it then - and it was something I wanted to get back into. At that point I hadn't even seen the film (Dodgeball), so I wasn't sure what I was getting myself into. What advice would you give to other girls thinking about becoming dodgeball legends? It may seem intimidating at first, but don't be scared. Just play. It's loads of fun. And once you get the hang of things, it's smooth sailing from there. How much does being Canadian help you in dodgeball, we've noticed a lot of the top players are from North America. Why is that? Hmm, I'm not sure if being Canadian/North American has anything to do with being good at dodgeball, BUT, perhaps it's because we play a lot of sports whilst growing up, in school, and in general, regardless of the weather.I noticed that many of my friends in London didn't really partake in sport activities in their spare time. It was never like, "Hey, what are you doing tonight, or this weekend? Wanna throw the ball around etc?" I remember even asking a friend, so what do you do on the weekend? Do you play sports like soccer etc? He flat out said no and gave me an incredulous look. So maybe it is a cultural thing, or maybe it's the lack of athletic infrastructure or space in London. Dodgeball is fairly new to South East England. Should we embrace it or is Tunbridge Wells 'too posh to dodge'?! Kidding aside, it's nice to see dodgeball expanding to other regions. It's a great team sport! Thanks Christina, we'll see you on court soon. Team NZ unveil their controversial new tactics for dealing with Team Canada's star player. Open letter to businesses interested in supporting Tunbridge Wells Dodgeball Tournament for the Stroke Association. I am delighted to announce that on Sunday 7th July 2013 I will be hosting a dodgeball tournament at the Tunbridge Wells T.A. Centre, St. Johns Road. This is a unique event in Tunbridge Wells. The first time a Dodgeball UK tournament has come to West Kent. I believe that this is a fantastic opportunity to try and fun and social a sport I am passionate about at the same time as raising funds for a terrific charity, The Stroke Association, whose work offers great support to stroke survivors and their families. The venue has been booked and the equipment will be provided courtesy of Dodgeball UK. With just over a month to go there's lots of work to be done to make the day the huge success I am confident it will be. On the day I will be running the event ably assisted by friends who I have roped in to help. However, we do need outside help to achieve our goals. If you'd like to help us please feel free to consider the following options. 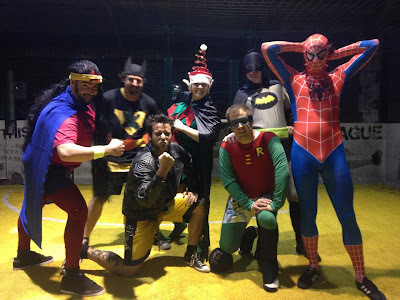 Are there any potential dodgeball legends working in your business? The best way to get involved in the event is to play the game. 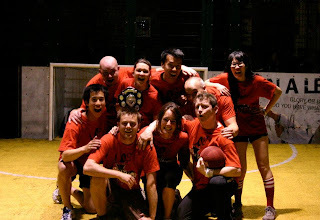 Dodgeball is a fun, social mixed team game suitable for all abilities. A great team building activity. Entry for the tournament is open to everyone. Groups of friends, sports clubs and work colleagues. This is reflected in the entry cost (minimum donation) of £70 per squad (7-9 players). At around £10 per player for 3 hours of dodgeball this is tremendous value without even taking into consideration that all proceeds are going to help stroke survivors adapt to the new challenges they face. If you don't believe you've got enough players for a team please feel free to refer interested individuals to us and we'll sort them into a group of like minded individuals. To enter a team please visit our sign-up page (which will send you to Just Giving. Unlike our beloved overpaid Premier League footballers. Dodgeballers will play solely for the glory. However, its always nice to receive a reward for your efforts and they don't even have to be elite athletes to pick up a prize. At the end of the event, some group of overly competitive fitness junkies will take home the inaugral DodgeRTW Trophy, after taking the event way too seriously. However, I like to think the prizes for Best Fancy Dress and the Fair Play Award and the Wooden Wrench are equally treasured. I'm open to ideas for suitable prizes and donations, the best prizes won't necessarily go to the event winners! The good news is the the venue has a bar! The bad news is that it costs money to open and staff. At present the bar will be closed throughout the event as its an unnecessary luxury. We'd love to be able to open it to allow our guests the opportunity to take a refreshing drink to reward them for their support and exertions. I'd be delighted to credit those who help make the event a success or respect the privacy of any donors that prefer to remain anonymous. Please contact me separately should you wish to sponsor anything. Thank you for reading this far. If you have any questions or other ideas please do not hesitate to contact me to discuss. Is Tunbridge Wells to posh to dodge? Letter of authority from the Stroke Association. We're legit! 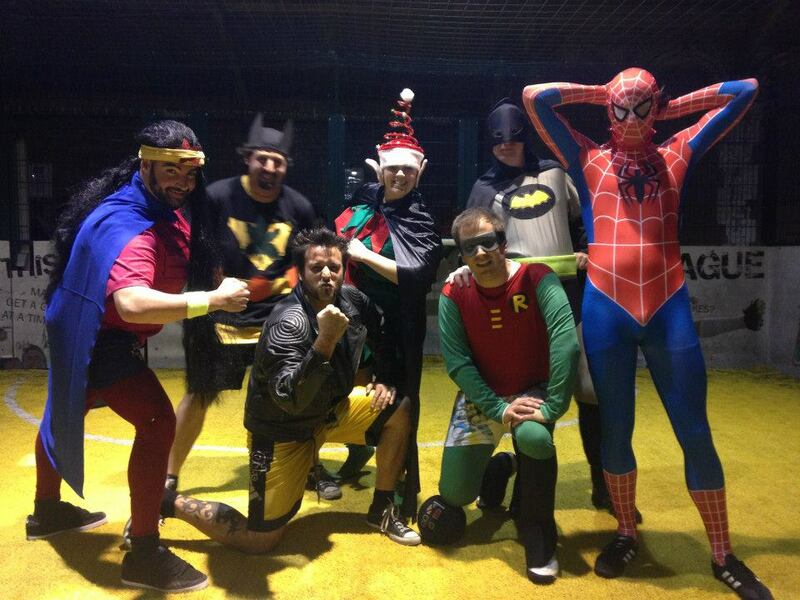 Super Fancy Dress, Average Dodgeball team. OK, scrub that idea. lets have a Rookie Dodgeball tournament!!!! £70 (minimum donation) for a team - includes squad members. Teams can be made up of friends, sports team mates, work colleagues and absolute ringers. Individuals welcome. We'll put you into a team. We're aiming for a maximum of 12 teams. Teams will be split into 2 groups once we go over 8 teams. 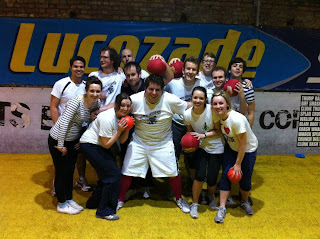 Organiser of the Tunbridge Wells Charity Dodgeball tournament in aid of the Stroke Association. Self-proclaimed dodgeball legend. Inventor of 'the kneel' dodgeball tactic (with very mixed results). Founder and captain of 2012 Dodgeball UK Cup Champions 'The Awful Dodgers'.